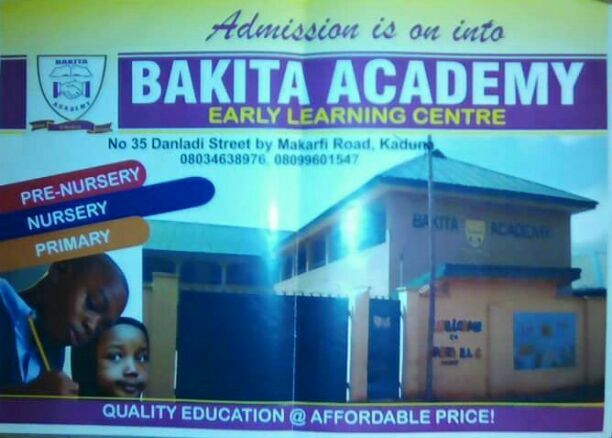 A Kaduna based private School, Bakita Academy Early Learning Center, has been opened and will commence academic session in September 2016, while registration is currently in progress into various classes at affordable price with Uniform. The school is situated at Number 35, Danladi Street, Makarfi Road Rigasa Kaduna. The echool also run Islamic School Section based on the policy of education and at affordable fees. In her welcome address during the opening ceremony at the School’s premises, the School’s Headteacher, Hajiya Safiya Inuuwa said, Bakita Academy has everything in place to meet your taste on academic ground and qualitative education through staff, good structure for security and up-to-date materials. The Headteacher added, “we are soliciting for your supports and cooperation as normal so that to make great and conducive environment for learning of our children”. “You own the School in this community for the benefits of our children. We would not hesitate to partner with you to receive your complaints, grievance over your children academy, welfare to the management and School”, she stated. Hajiya Safiya urged the parents and guardians to encourage their children and wards on punctuality, checking their work book at home and guide them then in their home work and warned not to do it for them. She then observed that, money can buy anything of choice but not education noting, it can only support knowledge, hence the need to give children qualitative education so that to have rest of mind and be proud of their future.